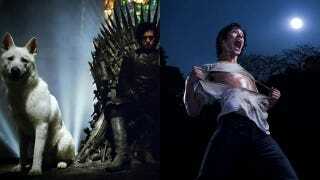 Which Sunday show are you more excited about: Game of Thrones, or Teen Wolf? It's direwolves versus teen wolves! Next Sunday, MTV's new Teen Wolf series airs right after HBO's Game of Thrones adaptation. Which one are you more thrilled about? Vote in our awesome poll! Also in this week's television: The Doctor makes a shocking discovery on Doctor Who. Ultron rocks the Avengers. The JLI (yes, the JLI) must save Batman from a time-traveling menace. And a Mars Rover gives up the ghost. Television is your friend! Amazing World of Gumball is on Cartoon Network at 7:30 PM, with two episodes. First: "Gumball and Darwin help Anais rescue her doll from Tina Rex." And then: "Gumball and Darwin are unwitting accomplices in a gas station robbery." At 8:15 PM there's a new Mad. Then at 8:30 PM, there's a new Regular Show, in which "Skips accidentally kills Rigby and has to arm wrestle Death to get him back." And then at 8:45, there's a new Problem Solverz, in which "The Problem Solverz wake-up to discover a problem: everthing in Farmboro seems different." And then at 10 PM, National Geographic Wild has the series premier of a show called Man V. Monster, "Flying Demon." And that's all the information we've been able to find out about it. After an exchange student named Mai Lee shows up in town to stay with Velma, strange Kung Fu wizards begin attacking the town trying to get her. As it turns out, Mai Lee has a ring they are after. The gang decides to help – but friction arises when Shaggy develops a crush on Mai Lee that really gets under Velma's skin; and Fred inadvertently trashes Daphne's home when the wizards attack there. Fortunately, they find an ally in Crystal Coves Tea Shop owner Chen, who reveals to them that the wizards are after the "Dragon's Heart," a mythical jewel that he just happens to be guarding. Now, it's up to the gang to solve the mystery before they lose the Dragon's Heart, and Mai Lee... forever! The Witch enlists Daffy as an unlikely mentor for her son Gossamer in "Monster Talent," this week's episode of The Looney Tunes Show airing on Tuesday, May 31 at 8 p.m. (ET, PT) on Cartoon Network. Gossamer is a sweet and lovable giant hairy orange monster, and unfortunately, his kind nature and odd looks make him the perfect target for schoolyard bullies. The Witch wants a positive male role model to help Gossamer fit in and make friends, and after Daffy asserts that the only way to help a weirdo another weirdo's expertise, he gets forced into the job as Gossamer's new guide. After a few failed experiments to boost Gossamer's social stature, Daffy decides the school talent show is the perfect path to popularity. Meanwhile, Bugs becomes an unlikely celebrity after appearing in a television commercial for Speedy Gonzalez's restaurant, Pizzariba. His catchphrase takes the town by storm, and in the end, Bugs' stardom helps Gossamer overcome his woes. Wile E. Coyote and Roadrunner are back in cinematic-quality CG animation with the short, "A Zipline in the Sand," featuring the classic slapstick comedy and Acme products fans know and love. Adam and Jamie test whether a person can really dodge a bullet. From measuring the travel time of bullets to testing human reaction time, the guys ultimately put this myth to the final test: they shoot at each other and attempt to jump out of the way. Will they dive to survive …or take a hit and tumble? Meanwhile Kari, Tory and Grant investigate a common question: is water really as hard as pavement? It's widely believed that hitting liquid from a great height has the same impact as hitting solid ground. Clearly, this is a job for Buster, so he is rigged with a myriad of accelerometers and dropped onto pavement, then onto water and back again from ever increasing heights. A new South Park is on Comedy Central at 10 PM. At 8 PM, National Geographic has a special, Death of a Mars Rover. "After seven years of service, the Mars rover Spirit may be facing its final days. NASA makes last-ditch efforts to save the vehicle." And that's followed at 9 PM by a new Known Universe, "Biggest Cosmic Blasts." Volcanic eruptions aren't unique to Earth they are common throughout the solar system. Eruptions are capable of both destruction and creation, and we'll see their astonishing effects on humans and entire galaxies. We'll head to the big island of Hawaii to get up close and personal with one of the most active lava fields on the planet. Is there a way to predict when the next catastrophic eruption might occur? The JLI travel to the past to try and stop a force that wants to wipe out all the incarnations of Batman throughout time. And then at 10 PM, there's a new Camelot on Starz. When Jayden is kidnapped by Deker, the other Rangers must summon the strength to fight a mutant Nighlok without their leader. At 9 PM, there's a new Doctor Who on BBC America: "The Almost People." British people have already seen this episode, but please don't post spoilers in the comments. For now, let's say the Gangers get into a bit of a mash. And two Doctors may not be enough to solve the problem. The episode ends with a startling cliffhanger, as Steven Moffat has been warning for weeks. And if you can come up with a better pun than "gangers and mash," you get your own slightly melty duplicate. Here's a sneak peek. As the devastated team struggles with a loss, Ant-Man and Iron Man go about destroying all remnants of Ultron. But they don't realize that Ultron has transcended his body, and has infiltrated the world's computer systems. Events in King's Landing take an unexpected turn. Tyrion Lannister joins his father's army as the stage is set for a major confrontation. From the creator of "Criminal Minds," Jeff Davis, and the executive producers of "The 4400," Rene Echevarria and of "Prison Break" Marty Adelstein, "Teen Wolf" combines friendship and love in the context of horror and high school. "Teen Wolf" stars Tyler Posey ("Maid in Manhattan," "Brothers and Sisters"), as the newly bitten werewolf, 'Scott McCall,' Crystal Reed as the mysterious new girl in town, 'Allison,' Dylan O'Brien as Scott's best friend 'Stiles,' Tyler Hoechlin ("Road to Perdition," "7th Heaven") as the older werewolf, 'Derek Hale' and Holland Roden as 'Lydia,' the popular girl with a secret. Always an outsider and often unnoticed, Scott McCall yearns to be recognized in some small way that takes him out of his typical state of high school anonymity. When his best friend, Stiles, convinces him to go into the woods one night to join a police search for a dead body, Scott encounters a creature in the darkness. Narrowly escaping an attack with a vicious bite in his side, the next day brings strange surprises for Scott at school and his life will never be the same. And the evening's excitement doesn't end there. Adult Swim is showing a new episode of Aqua Teen Hunger Force at 11:45 PM. That's followed by Superjail! at midnight.